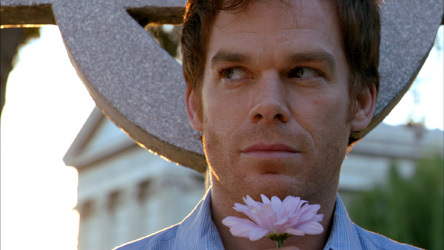 Dexter goes after a groundskeeper in one of the creepiest episodes to date. Well that was short-lived. Deb’s rehab beach house lasted all of two episodes before she almost got killed by one of Dexter’s projects in a bull costume. One day with Dexter’s process and Deb is ready to put some serious space between her and brother dearest. Can you blame her? Though this is something that I feared would happen, it really does seem like the most natural progression for the characters. Deb would have to try to control him. Dexter would have to react terribly to the constant watching. Dexter would then try to change her mind by including her in his process, not realizing that she’s sane and good and moral and would be freaked as fruit loops about him “vetting” other serial killers. In the end, the conversations between Deb and Dex have lived up to 6 seasons of potential. Deb is asking all the right questions and Dexter, surprisingly, doesn’t have all the answers. Even though he’s back on his own, Deb’s words are still with him and there’s a change in his heart. As he says at the end of the episode, he’s free now, but at what cost? How will Deb intervene now? Susan: I really hope that Dexter starts using his lizard brain to help Deb instead of obstruct justice. I liked that he tried to bring her in on his process and Deb, justice monger that she is, is rightfully intrigued about catching more bad guys. It’s also an interesting moral dilemma for her to take advice from the very part of him that is a capitol offense. His lizard brain has helped her catch countless bad guys over the years. It’s what put her in the position to be Lieutenant now. All of her instincts have been honed and crafted by it. So does she now feel guilt about those instincts? How can she resist asking Dexter for help now that she’s seen his investigative skills in action? That being said, I think she’ll be forced to intervene by circumstance. She’s bound to find out what LaGuerta’s up to soon enough and now that the scary Russian knows Dexter’s name, she’s going to be involved in that one too. As long as it doesn’t involve Deb covering Dexter’s tracks any more, I think the writers are on the right track with this. My worry is that Dexter is going to take his not-killing seriously and actually get it under control. Then something unexpected will happen (bald bull goes missing, or they find Louis’ blood) and Deb turns on her brother, no longer trusting a word he says. She’ll tell the police everything, implicate herself, Dexter will go to prison, and then the bald bull will show back up, unscathed. Dexter will be released, but everyone will have turned against him. Then he will systematically kill every single main character who has somehow managed to survive thus far. Not really, but I would like to see some scenario like this. I like watching Dexter sweat and try to do the right thing. And those are two things we haven’t had a great deal of these last few seasons. Will Louis be even more disruptive in death? Susan:It was so satisfying to have the scary Russian kill Louis. It would have been even more satisfying if he had killed him before the little punk had given up Dexter’s information. His story just never really gained any traction, mostly because it was introduced in that pit of despair known as season 6. I hope the fact that Louis’ blood is now on Dexter’s boat becomes an issue. I always root for Dexter, but I especially root for Dexter in terrible situations, and this one seems perfect. Remember when Quinn was on his trail and he had to kill the other guy in the van but then the blood dripped out of the van on Quinn’s shoe and it looked like he was going to be the one in serious trouble? That was the best. The hardest kills for Dexter to escape are the ones he didn’t commit, and I hope this one comes back to get him. Steven: It would be just like Louis to keep being annoying as a ghost. I’m sure that he will issue in some new difficulties for Dexter — the mobsters yes, but also the blood that dribbled onto the deck of the “Slice of Life.” I could easily see some eye-witness coming forward to bring suspicion on Dexter (and for a murder that he didn’t commit!) Is that what will bring Debra around to testify against her brother? Certainly Louis couldn’t be painted out to be a sociopathic threat. A sociopath, sure, but not a threat. Unless you’re deathly allergic to mannequin arms… or hotel managers. Although, it would be a nice twist if he actually caused problems as a ghost. So, instead of Dexter’s little angel dad or little devil brother, he is visited for the rest of the season by a passive-aggressive former coworker who instead of trying to sway Dexter towards Good or Evil, offers him occasional rants concerning collector edition Tamagotchis. I liked following this week’s Dexter with a viewing of Homeland. Here are my thoughts: If Carrie and Saul act independently, intercept a terrorist, and kill him, then all they need to do is supply the CIA with the necessary intelligence after the fact. If they’re abroad, they can simply make it to the airport and not bring it up again stateside. We, the audience/ American people, are quite grateful they’re out there doing this. The significant difference is that we are at war, and they are fighting acts of terrorism and espionage (international threats). Also, there is a clear delineation throughout between good soldiers and bad soldiers, between US Marines and al-Qaeda. The ends justify the means, because the means are not being used against domestic threats (Americans) but against outside threats. So, how is Dexter different? He is going after domestic threats. The laws concerning those threats are different. This is because America places a premium on liberty and a fair trial. We are not outraged by Dexter, because he is not unjust. He is merely breaking the law and depriving these guilty people of a fair trial by a jury of their peers. His justice is not immoral or unnatural, only unconstitutional according to our current Democracy. This is a wild thought to have. So that was some serious Silence of the Lambs level creepiness in Speltzer’s house of horrors. Dexter didn’t exactly take it easy on Deb, did he? My favorite thing so far about this season is that I’ve been scared and surprised by something in each episode. This was the first time I’d ever had to watch the show through my fingers. Quinn’s story line with the stripper/wannabe dog walker reminds me a lot of The Wire story line with Lester and Shardene. I just keep waiting for her to put on glasses so that we know she’s a good girl. Other than that, the story is pretty much filler. Will Batista ever get anything to do again? I miss him. Chuck’s Sarah had a pretty weird introduction. Was that supposed to be sexual tension or fear between Dexter and Hannah? I’m still not quite sure where that’s going, but I have high hopes.